LAS VEGAS, NV--(Marketwired - Dec 6, 2013) - Geek Beat and Mobile Nations today announced that they are once again joining forces to provide live video coverage of the biggest tech event of the year, the International CES. CES 2014 takes place in Las Vegas, NV, from January 7-10, 2014. Geek Beat and Mobile Nations -- which includes the Android Central, CrackBerry, iMore, and Windows Phone Central family of sites -- will host interviews and conduct live product demos from the show floor. Hosted by podcast pioneer Cali Lewis, tech evangelist John Pozadzides, Android and Google expert Phil Nickinson, BlackBerry champion and Mobile Nations' Chief Media Officer Kevin Michaluk, Apple analyst Rene Ritchie, and Microsoft and Windows Phone pundit Daniel Rubino, Geek Beat and Mobile Nations' CES Live coverage will air from the lower level of the South Hall at the Las Vegas Convention Center during show floor hours from January 5 to January 10. Each day will feature a steady stream of news and analysis, one-on-one interviews, technology showcases, and more. 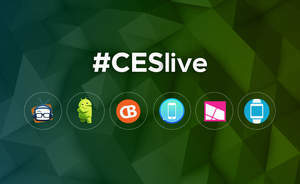 "CES is the largest tech event of the year," said Kevin Michaluk, Chief Media Officer, Mobile Nations. "It's been around for 40 years, it hosts over 3,200 exhibitors and 152,000 attendees from around the world. After the success we've had teaming up with Geek Beat earlier this year for Talk Mobile 2013, we decided to kick off 2014 together with a bang by providing the best live coverage of the biggest show. There's no event our audience is more excited for, and no better way to bring it to them! " "Whether as a sponsoring partner or guest interviewee, the massive web and social reach of Geek Beat and Mobile Nations' combined audiences makes CES Live the perfect venue for companies to amplify their CES presence," said John Pozadzides, CEO of Geek Beat. "With over 30 million visitors to our communities per month, nobody else can bring home the live excitement of CES the way we can." For more information, sponsorship opportunities or to request to be a guest on CES Live, please contact James Falconer at james@mobilenations.com. Mobile Nations is the leading network of mobile-focused online communities with more than 27 million readers and 75 million page views per month. Android Central, iMore, Windows Phone Central and CrackBerry form the core of Mobile Nations. Geek Beat is one of the world's most recognizable tech news brands, delivering a daily news show with hosts Cali Lewis and John P., as well as a weekly LIVE show every Friday at 3 p.m. CST, which also airs nationally throughout the week on the YouToo TV network.